Palestinian President Mahmoud Abbas announced Thursday that the option of a Palestinian state with provisional borders was unacceptable to the Palestinian leadership. Abbas's spokesman said the option will not be discussed under any circumstance. It has recently been reported that Prime Minister Benjamin Netanyahu decided to explore the option of an interim peace deal with the Palestinians in light of the political deadlock. "Anything less than an Israeli withdrawal from lands occupied in 1967 (the West Bank, Gaza and east Jerusalem) is unacceptable to us," Nabil Abu Rdeneh said. "We oppose the option of a state with provisional borders." The Palestinian official said that the Israeli plan's aim was for the Palestinians to cede Jerusalem which he said was unacceptable. Saeb Erekat also noted his opposition. "This talk of an interim accord and a gradual plan reflect the fact we have no peace partner." The Associated Press quoted Israeli state officials who said Israel was exploring several options after reaching the conclusion that a final status agreement could not be achieved at this stage. Netanyahu is slated to give a speech in the coming weeks where he may discuss a possible change of direction in the peace process. "The consistent refusal of the Palestinian leadership to negotiate with Israel has made a negotiated agreement all but impossible to achieve, at least for the time being," one government official said. "And so we're looking at an Israeli initiative, and steps that we can take that would be a phased approach to a final status agreement." In closed talks, Prime Minister Netanyahu said that the government should consider the option of an interim accord with the Palestinians. The Prime Minister's Office said the plan is preliminary and will not address all issues of a final status agreement. Sources close to Netanyahu said off-the-record the concept was a default option as far as the prime minister was concerned as the Palestinians failed to demonstrate willingness to enter into negotiations. Ideally, Netanyahu wanted direct talks which would result in a final status agreement but acknowledged the fact that the Palestinians are not capable of signing such a deal. Under these circumstances the option of an interim accord is being considered. The prime minister has been holding meetings with US congressmen over the past few days who have suggested he present the idea to the Congress. He is scheduled to speak at the AIPAC conference in Washington in May. His staff members are currently trying to coordinate meetings with US state officials to be held during this time. Israeli officials fear that the UN's General Assembly will recognize a Palestinian state on 1967 borders. 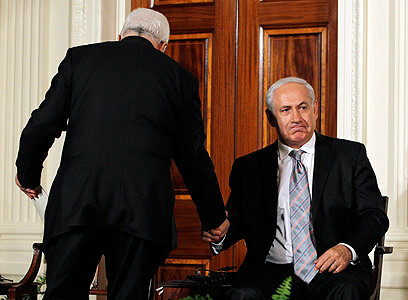 See all talkbacks "Abbas: We won't accept interim peace deal"